Ria Loves Pawlish: Beauty Clearance at Target! as usual, i've been in complete denial that i'm going to go on a trip next week. which means, as usual, i'm scrambling to make sure i've got everything i'm going to need and got myself ready to go. which i'm not. i've got to dye my hair still, which as you all know is such an annoying process! i had to go to Target for some Pixi Glow Tonic To-Go as it is so much more simple travel with pre-moistened pads than with liquid toner. they had some awesome clearance which i just had to give you guys a heads up about! i was delighted to find the Sonia Kashuk brush sets half off... i've been watching these since they came out and almost bought the large one multiple times at full price... $39.99! i'm so happy i only paid $19.98! the smaller eye brush set was $19.99, and is clearanced to $9.98. none of the brush sets are marked down online, so these are something you're going to have to hunt down in store! mine had quite a few of each... the cartoony drawings on the handles are weird, which may be why they didn't sell as well as her brushes usually do. sadly, it appears Shea Moisture cosmetics are being deleted from my store... all the products are on clearance. the products on the website aren't marked down, so i have no idea if it's just my store or all Targets! the eyeshadows are marked down from $5.99 to $2.98, the eyeliners from $7.99 to $3.98. have you seen any of these deals? are you going to go on the hunt for any? 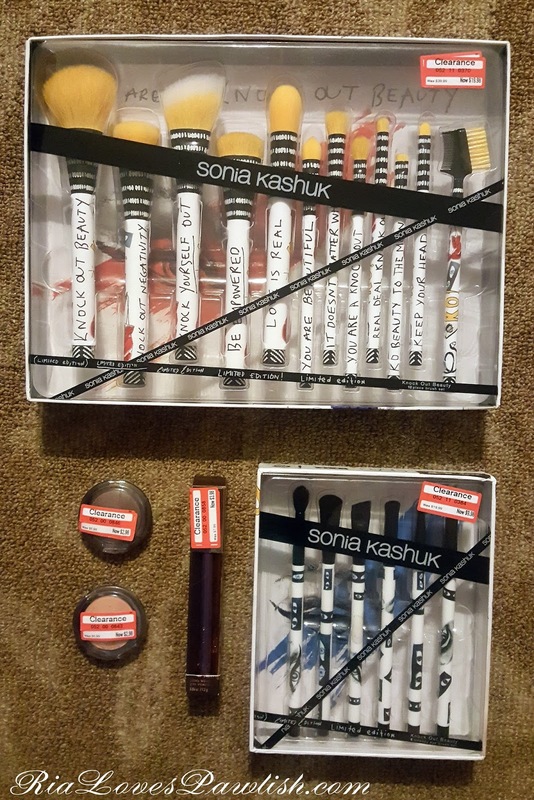 as a brush aficionado (read :: hoarder) i just had to have these! China Glaze Rebel... Holo At Ya Girl! Article on Sun Protection from Dr. Papantoniou!